Last year I shared a list of 10 Random Zombie Survival Intro Scenarios based on my ad-hoc zombie survival/horror game (which is kinda like a DCC Funnel but set in the modern world, and with zombies). It was actually one of the most popular posts I ever wrote on this site (people still really seem to like zombies, go figure) so I thought it was time for a sequel. Last time the set-ups were pretty standard fare. 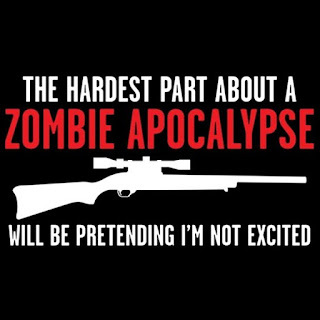 Scenarios you've seen in many zombie movies, games and books. A rag-tag bunch of strangers, thrown together in an every day situation (a crashed bus, locked in a mall, hiding in a cabin in the woods) and they must survive the overwhelming onslaught of the undead. Death is rampant and expected (each player begins with four 0-level characters), and only the best (or more likely luckiest) will survive.